As I watch Orpheus, my Italian Greyhound eat his food I notice that he meticulously picks over the bits in order to eat the kibbles. I wonder if all dogs do this. He eventually goes back to eat the bits I suppose because he is either still hungry and realizes he’s not getting anything else until the bowl is empty, or he figures he may as well eat them since they are just sitting there. He doesn’t have the capacity to throw them out although on occasion he has spit the bits out onto the floor to which he later returns to eat. Now I don’t know which are the kibbles and which are the bits, but it’s the soft chewy ones that occasionally end up on the floor. Sometimes we treat life exactly like Orpheus treats his food. The things in life that we like we keep and other things in life we wish we could get rid of we often just toss aside and hope they just go away but they never do. Sooner or later we have to deal with it because somehow or another it is part of what sustain us. I suppose it’s important to remember that what God gives is always good. 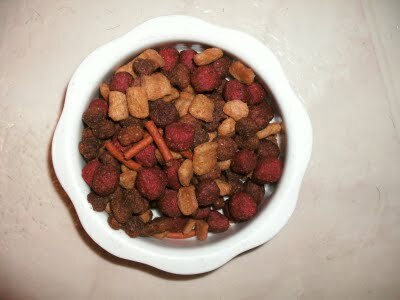 Sometimes it’s kibbles and other times it’s bits. Either way by God’s grace all of it has one purpose; God’s purpose. So, blessings to all and enjoy the weekend! Remember to go forth into the world thanking God for the kibbles and the bits, and the peace of God which surpasses all understanding will guard your hearts and minds in the knowledge and love of Jesus Christ. Philippians 4:6 Do not worry about anything, but in everything by prayer and supplication with thanksgiving let your requests be made known to God. What a simple yet powerful message! Thank you. Your welcome. At the end of an up and down week, this was a little hard to “swallow” but once again the Spirit moved to put me in check. So nice to have you as my friend.